Danguaire Castle was built in 1520 by clan O'Hynes on the picturesque shores of Galway Bay . The palace takes its name from the nearby ancient fortress of King Connaught, who died in 662. In the early 17th century the castle was passed into the hands of the Martin family from Galway. Richard Martin was mayor of Galway and lived there until 1642 and the last of his family occupied Danguaire from the beginning of this century. In 1924 the palace was bought by the famous surgeon of that time. 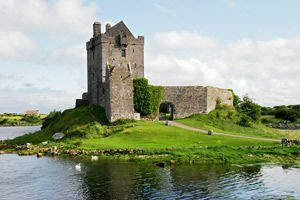 The Dunguaire castle was also restored at the time of the Celtic revival in Irish literature. Then the stone walls of Danguaire become a meeting place for famous artists. In 1954 the palace was bought by Christoph Maria Amptil who definitively ends the restoration of the building. Now you can walk around the restored castle and fine that it is a kind of journey through time to the late Middle Ages. After sunset the castle is a favorite place for private banquets and other celebrations - again in the period from April to October. Of course, to ensure the unique atmosphere of a medieval feast in the castle Danguaire you must make a reservation. Regular literary and poetic evenings take place, accompanied by much music, intimate atmosphere and excellent food is an experience that one will not forget. The castle Danguaire is an intriguing belief that the Lord was generous to his estate during his lifetime and continues this tradition in the after life. It is believed that if you stand on the main gate of the palace Danguaire and ask some questions, you will receive an answer by the end of the day.